Health-conscious men and women want to keep their teeth as clean as possible for the sake of their dental health in Bloomington. However, they are also looking for convenience. 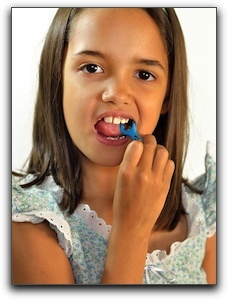 That’s why many of them turn to floss picks instead of traditional dental floss. These little tools are quite handy. They usually have a handle that is pointed and can double as a toothpick, and a length of floss strung in a U-shaped groove. They are cost-effective and can be used more discretely than floss. While this may seem like a dream come true for those hoping to make flossing a more regular part of their oral health routine, floss picks are still a step below actual floss when it comes to dental health in Bloomington. The American Dental Association has only approved dental floss for cleaning in between teeth. One issue is that floss picks can’t curve and form the angles needed for superior cleaning. So, what is a responsible dental patient to do? The first thing is to meet with your local dentist. If you love floss picks, continue to use them when convenient, but also try to use regular dental floss daily. If you are in the process of looking for a new dentist, we hope that you consider Create A Smile, PC – Dr. Ken Moore. We have been serving the Bloomington area since 2001 from our local office. We care about our patients and we are committed to helping them improve their dental health in Bloomington. Our friendly staff would love to answer any questions you have regarding flossing and concerns about dental health in Bloomington. We also welcome questions about cosmetic dentistry procedures such as teeth whitening and porcelain veneers. Call 812-332-1405 today to schedule an exam or consultation.